It was long day of very good talks followed by dinner with good conversations at TEDActive 2015. While most of the day was indoors, I thought I'd include a picture of the surroundings from my short walk to the conference center in the morning. As the picture shows, the weather is just warm enough that there is not snow on the ground. 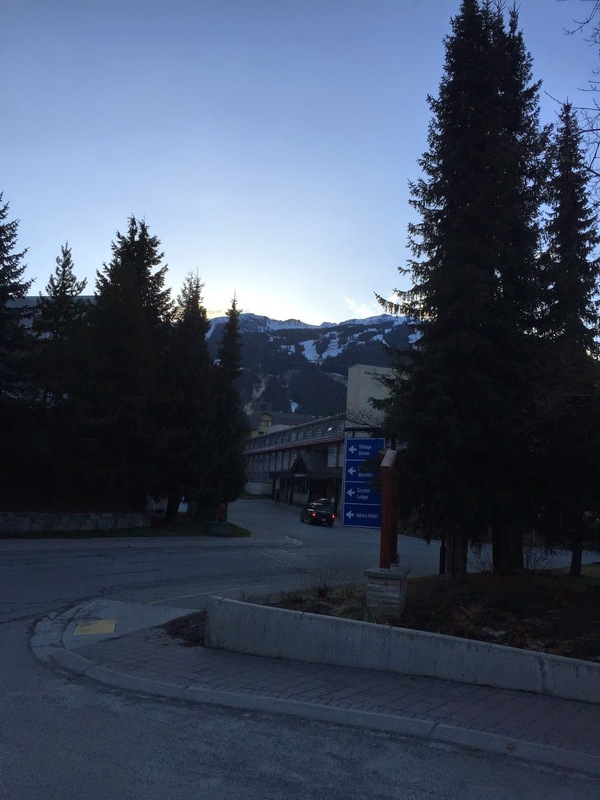 There is snow on the mountains, so the conference shares the town with lots of skiers. Anyone at TEDActive who is skiing is missing out on the program. The day's talks were structured a little differently from the previous day's. There were two sessions of talks in the morning like yesterday's, but in the afternoon, the sessions were TED University and Pop-Up Magazine. TED University is a set of shorter talks by members of the TED community. Of course, that community includes people like Bill Gates and Dan Ariely. Pop-Up Magazine is a sort of a live magazine that performs at various venues. It also reminded me a bit of the radio show This American Life. It's format is similar to TED's, but with more emphasis on telling true stories about people. While I quite liked a number of the talks, I felt TED would be better off doing a session of its own than subcontracting to Pop-Up Magazine. As was the case yesterday, there were too many talks to do more than highlight some of my favorite ones. The first talk was one by cancer researcher Siddhartha Mukherjee on the need for a change in the paradigm of medicine. He argued that since the advent of antibiotics, the paradigm has been to detect a disease and give the patient a pill to kill it. He believes we have reached the end of what that process can do and now we need instead to figure out how we can intervene at the cellular level to encourage the body to heal itself. He views the future of medicine as cells, not pills. He showed some research on how it may be possible to cause our own skeletal stem cells to grow new cartilage and even restore degenerated bones in knees. I want that technology! Tony Fadell, famous for his work on the iPod and the Nest thermostat discussed product design. He started the talk by examining the little stickers on fruit. Initially, we find them annoying, but fairly quickly we no longer notice them. When designing the first iPod, they decided to spend more time testing them with the side benefit that batteries would be fully charged when someone first opened the box. At the time, that was revolutionary and contributed to the full experience and success of the iPod. Similarly, with the Nest thermostat, the goal was to eliminate the need to program it. There was nothing earth shattering in the talk, but he had some interesting insights. Paul Tudor Jones, a billionaire investor, gave a talk on the problem of corporations and the danger of the current "profits mania." He showed some figures regarding the profitability of corporations (the highest in the last 40 years), resulting income inequity (very high and rising), and corporate charitable giving (below 1% of profits and falling). I came away thinking that Mark and I need to get our book published as soon as possible! Suki Kim told of her six months as an English tutor in North Korea to the next generation (late-teen boys) of the ruling elite shortly before the death of Kim Jong Il. Her telling of the environment of lies there was fascinating. The students had no exposure to the outside world and everything they knew and were learning was about their amazing leader. What struck me most was at the end of the talk she said that she hoped the young men would not attempt to change things, but would instead "live long, safe lives." That seemed like the wrong choice for them, but isn't that what I and we do in America? The talk left me with much to ponder. Steve Silberman gave a captivating talk about autism that shed new light on the topic, at least for me. He contends that at least part of the reason for the supposed increase in autism's incidence is due to Leo Kanner's misrepresentation of the disorder starting in the 1940s rather than Hans Asperger's theory from the same time. This misunderstanding of the disorder coupled with the movie Rain Man and the fraudulent paper about vaccines and autism created the "perfect storm of autism awareness." It would take too much space to follow that train of thought more accurately, but when the video becomes available, it is worth watching. This summary, however, gives some additional details. I really enjoyed the music of Rodrigo Y Gabriela. They are a pair of Mexican guitar players who manage to mix traditional Mexican music with percussion and heavy metal on only two acoustic guitars. It was quite amazing and I plan to look more into their music. 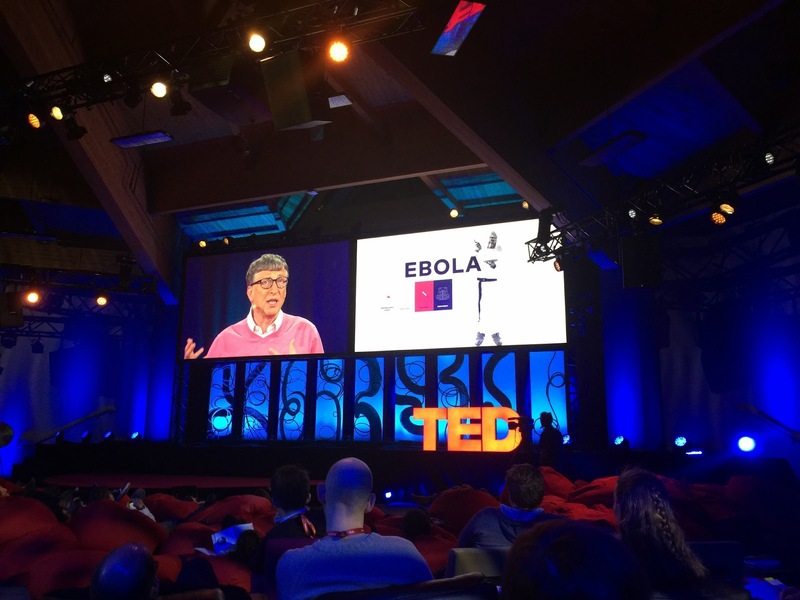 There were lots of other noteworthy talks such as Bill Gates on lessons we need to learn for the future from the recent Ebola outbreak. Theaster Gates, a potter, told how he was able to use the arts to repurpose abandoned buildings in Chicago and restore neighborhoods. Dan Ariely shared survey results about how people perceive income inequity (they vastly underestimate it) and what they think it ought to be (much more equitable than they estimate or than it actually is). Maryn McKenna described the very scary prospect of our ever shrinking antibiotic arsenal. Pamela Ronald persuasively argued in favor of genetically modified food. Dinner was one where we were forced to meet new people. That is never my strong suit, but I ended up having interesting discussions with a group of people from Switzerland, Canada, and the US. The conversation covered everything from what each of us did for a living, our families, religion, politics, and why none of us ski. It was one of those conversations that I never seem to have except at TED. I noticed only one reference to either Mother Nature or God and it was from Chris Anderson who while talking to Pamela Ronald about GMO foods said that many people would argue that you should not tinker with nature because it, "came from God." One other note before I get ready for the next day of filling up my brain. It looks like they've started putting talks on the TED Web site. David Eagleman's excellent talk on creating new sense is now live.